Marlene Bailey Burns was born in North Bay, Ontario. She was the daughter of W. J. and Annette Bailey. She was a graduate of Laurentian University. She was the wife of Dr. George E. Burns, and the energetic mother of three children, Jennifer, Cheryl and Gregory. She pursued a successful career in figure skating over a twenty year period. She was Director of Marketing Research at MCTV. Marlene held various executive positions, and chaired several different committees in numerous organizations in Sudbury including CFUW and the Sudbury Business Professional Women’s Club. Over the years, Marlene was particularly interested in establishing both mentoring and networking relationships for women and in raising funds in support of education for women. She passed away at the age of 51 years after a long standing struggle with breast cancer. Helen Mary Byrnes was born in Hamilton, Ontario. She spent her childhood and youth in Parry Sound where she developed the keen interest in outdoor sports which she was to carry into her teaching career and which were to bring her continued enjoyment throughout her adult life. She was an enthusiastic skier, skater, swimmer and golfer. She graduated from the University of Toronto, St. Michael’s College, with an Honours BA in Latin and French. She attended the Ontario College of Education in 1939 - 1940 qualifying for a Permanent High School Certificate. Her continuing interest in physical education and sports prompted her to return to the University of Toronto during summer sessions to obtain a Specialist Certificate in Physical Health and Education. During her teaching career, she not only taught physical education and health but coached the girls’ basketball and volleyball teams. Interest in the students with whom she worked later led to completion of the requirements for a Guidance Certificate. Appointed to the staff of the Sudbury High School in September 1940, she taught French, Latin and Physical Education. 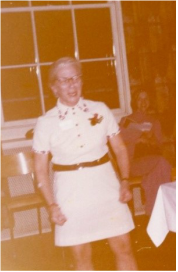 Her enjoyment of the students and life in Northern Ontario kept her at Sudbury High School until deteriorating heath forced her to accept an early retirement in June 1973. Helen was one of the 65 charter members of the Sudbury University Women’s Club, and a loyal supporter of all its activities. She was especially interested in the projects undertaken to raise funds for scholarships for Sudbury district students. She died in October 1977 at the age of 61 years. Grace Hartman was a social activist and politician in Sudbury who became the city's first female mayor on October 5, 1966. In addition to the distinction of being the first woman to serve as mayor in the City of Sudbury, Hartman also shares the distinction with Dr. Faustina Kelly Cook of being one of the first women to serve on Sudbury City Council. She served on council until 1954, when she was elected the city's comptroller. Hartman was also a president of the Ontario Municipal Association, a board member of the Royal Ontario Museum, and a chair of several social service and community organizations in Sudbury. In 1975, Hartman was named one of the 25 leading women of Ontario. Grace was a founding member of CFUW Sudbury and the first president. In 1955 she was a founding member of the YWCA chapter in Sudbury and later served as President. 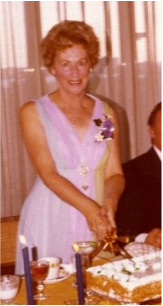 She was an honourary Life Member of the Business and Professional Women's Club of Sudbury. Grace organized the Sudbury Folk Arts Council and the Sudbury Ethnic Groups Programs presenting singing and dancing depicting their cultural life. Grace Hartman accepted an honorary Doctorate of Laws from Laurentian University and a lifetime achievement award from the city's business and professional women's association. CFUW-Sudbury took the lead and worked collaboratively with four other community groups to have the Bell Park Amphitheatre re-named in her honour in 2001. Creating the amphitheatre had been one of Hartman's key projects during her city council term. Click here to read a more thorough biography. Margaret Fyfe-Orange was the daughter of Joseph Fyfe, a long-time Superintendent of Inco, and Mary Fitzpatrick, an infectious disease nurse. She was born on August 8, 1918 in Cobalt, Ontario. Upon completion of her elementary schooling, she moved to Sudbury where she attended high school. She graduated from St. Michael’s College at the University of Toronto in 1941 with a Bachelor of Arts in Modern Languages. She attended the Ontario College of Education and later did post-graduate studies in French at McGill University, as well participated in a University of Western Ontario’s summer programme at Trois -Pistoles, Quebec. Before her marriage to Dr. Robert Orange, a widower with three children, she taught French, English, History and vocational Guidance at Sudbury High School. She and Dr. Orange had three children in addition to his three children. She devoted herself to community service through various organizations such as the Marymount College Auxiliary, the St. Charles College Guide, and the Newman Club Alumni of Sudbury. 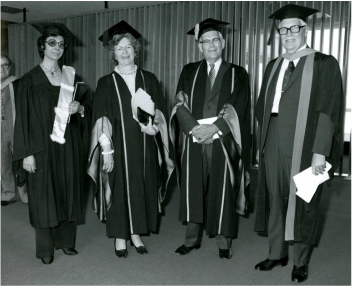 She was a founding member of the Board of Regents for the University of Sudbury and in 1978 received an honorary degree from Laurentian University. She played a very important role in CFUW Sudbury. She was a Charter member of the Club, She was its third president from 1952 – 1954. She was very involved in CFUW at the provincial, national and international levels. As well as serving as President of the Sudbury Club, she was Ontario Vice-President, CFUW National President (1967 – 1970) and elected fourth Vice-President of IFUW in 1977 at the conference held in Stirling, Scotland. In 1968, during her CFUW presidency, briefs were presented by CFUW to the Royal Commission on the Status of Women, and favourably received. She was also a member of the 1966 IFUW delegation to the UN Commission on the Status of Women in Geneva and she led the Canadian delegation to the 16th Triennial IFUW Conference in Karlsruhe, Germany in 1968. 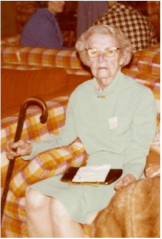 Margaret Fyfe-Orange died on May 1, 1987. Doris Thompson Lane was born in Toronto. She received her Bachelor of Arts in History and Modern Languages from University College, University of Toronto in 1906. While at university, she played violin in a string quartet that performed classical music at Hart house. Following graduation from Hamilton Normal School, she taught at Wellesley St. Public School in Toronto until December 1912. She married Frederick C. Lane, Sudbury’s first municipal engineer in December 1912. She came to Sudbury in January 1913. She had five sons. Two sons who were commissioned officers in the Air Force died during World War II. This was the one great disappointment in her life. She was a Silver Cross Mother by virtue of the loss of her sons in the war. She was active sewing for the Red Cross during the war. She was an original member of the Toronto chapter of Alpha Phi Sorority. She was a devout Anglican, a life member of the Anglican Church Women and an honorary member of the Altar Guild of the Church of the Epiphany. She was interested in current events, music and history. She was active all her life. She continued to enjoy walking and swimming into her late 80s, as well as being a hostess to large family gatherings. Doris was an early member of the University Women’s Club in Sudbury, the precursor of the Canadian Federation of University Women – CFUW Sudbury. For many years, she was the oldest member of CFUW. 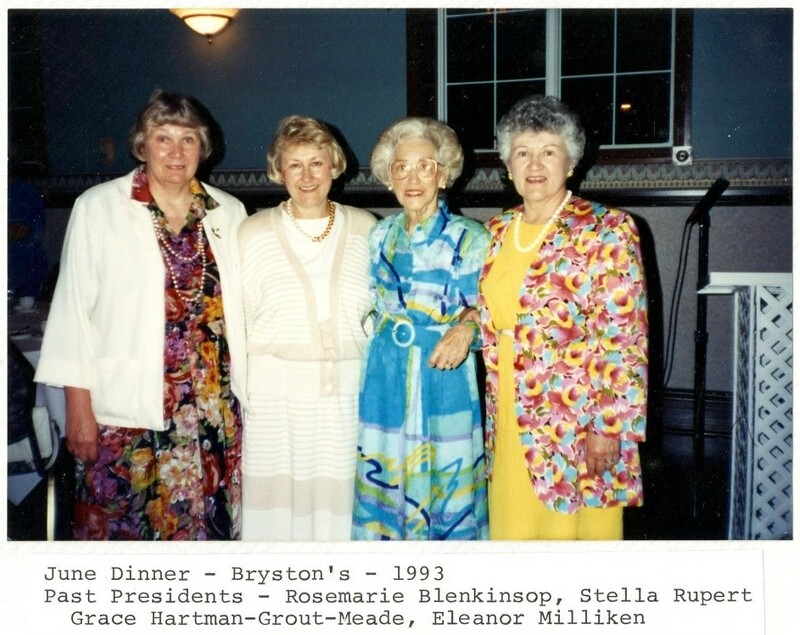 When CFUW Sudbury celebrated its 25th anniversary in 1973, she was honored as the member with the longest service and the scholarship was created in her name. Doris was present when it was announced. She was in her 92nd year when she died in 1976. Eleanor Milliken graduated from the University of Toronto in 1954. She taught Physical Education in Toronto and Sault Ste. Marie before moving to Sudbury in 1967. In Sudbury, Eleanor was the head women’s basketball official. She organized and trained the officials for the women’s secondary school basketball league as well as officiated at the college and university levels. She worked many years as a supply teacher in our secondary schools. Eleanor Milliken was a dedicated member of CFUW Sudbury for almost 50 years. In her second year, Eleanor accepted an executive position and has held every executive position in the club. She was president from 1974 – 1976. Apart from assuming leadership roles, she was active on a continuing basis on many committees, such as this Club’s Awards Committee. 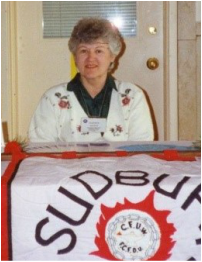 In addition to being an active member of CFUW Sudbury, she was Regional Director for Ontario North from 1992 – 1996. She was president of Ontario Council and vice-president of CFUW National from 1996 – 1998. She attended CFUW meetings across the country. She was vice-president of CFUW national from 1996 – 1998. She was on the 1998 National AGM planning committee for the AGM in Sudbury. She held the position of National Coordinator of International Relations and a member of CFUW nomination committee. She also was very involved with the Virginia Gildersleeve International Fund, which is affiliated with IFUW and grants globally to locally generated projects that advance the rights of women and girls. In 2001, she volunteered at the IFUW meeting in Ottawa and helped with Boot Camp registration​. Eleanor Milliken promoted the club and represented us at various levels. She was very welcoming to new members and was a true inspiration to many CFUW members in Sudbury and throughout the north. Grace Hartman was the first president of CFUW Sudbury. She is shown here, in blue, at 92 years of age.